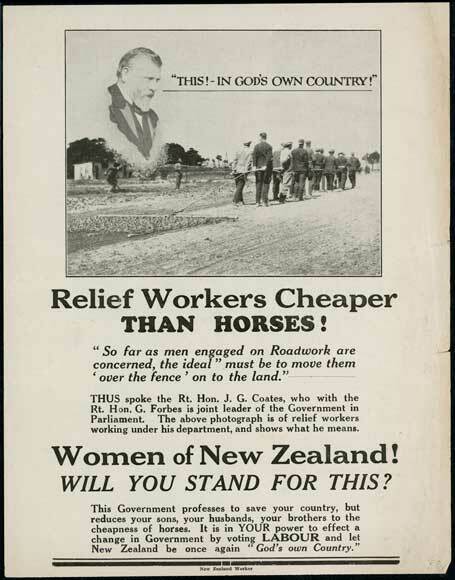 This 1931 Labour Party election leaflet shows a gang of relief workers (unemployed men carrying out state-created work in order to qualify for unemployment relief). They are dragging a harrow to prepare ground for planting – work usually carried out by draught horses. Former Premier Richard Seddon, whose Liberal Party was one of the forerunners of the Labour Party, watches the scene with sadness. For its first few decades the Labour Party was dominated by unionists and other representatives of low-income people, and favoured state intervention in the economy to address major economic and other problems. In later incarnations the party moved sharply away from this original vision.